I have been lucky enough to attend five of the past six Association of Canadian Archivists Conferences. Unfortunately, this year that luck ran out and I had to experience the conference vicariously through the entertaining (albeit often sideways) Facebook Live Streams from the ACA and through the insightful tweets of my fellow archivists (#ACA2018). 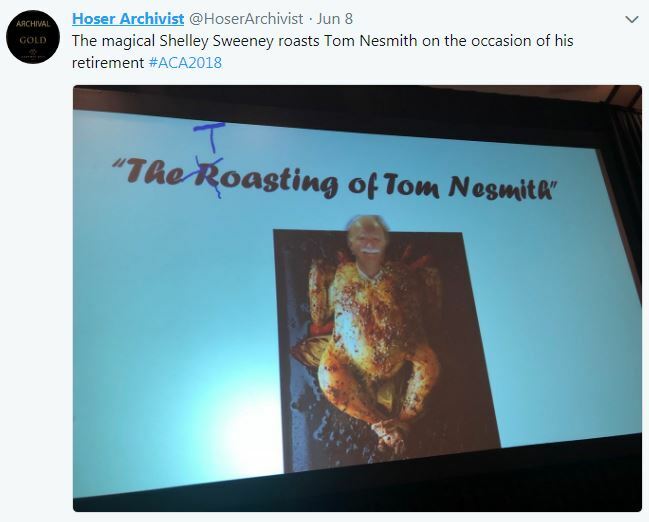 I was especially sad to miss the celebration of the career of Tom Nesmith, though I appreciated being able to hear Shelley Sweeney’s roast. I am excited to be writing for Things I’m Fonds Of this week, a blog that I have been a big fan of for that past few years as I’ve been completing my Dual MAS/MLIS degree at the UBC iSchool. 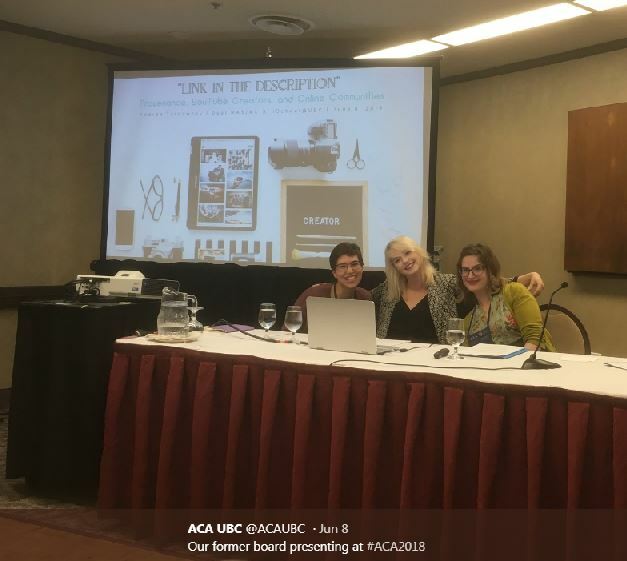 The ACA 2018 Conference in Edmonton was my first time attending our storied professional gathering and it was also my first time presenting during the student session. Still being a student and presenting new, independent research is a terrifying, but exhilarating experience, that definitely affected my perspective of the conference. So while I did end up missing out on some sessions to panic edit my presentation, some of the main threads that I observed over the three days were about ethics and re-centering creators and users in archival practice. In almost every session, ethics was on the tip of every archivist’s tongue. Technology is a double-edged sword, that has the potential to better serve users and archival practitioners, but also has the potential for harm in trying to keep up with the “bleeding edge.” The affordances of visualization techniques and web capture technology to crawl and capture social media content poses a risk of collecting and presenting private information inappropriately. On the final day of the conference, for example, Jeremy Heil talked about the ethics of silent capture in order to collect records of student groups and the student experience on campus, not only university departments and units. The discussion raised some interesting questions: How do we as archivists responsibly capture “open” social media content? Where is the consent to capture? While taking measures for transparency (open seeds lists) it still leaves the ethical question that just because this content is accessible, does it make it fair game? Ethics also came up in Allison Mills’ and Emily Larson’s presentations about the visualization of big data sets. One can lose sight of the human component amid the sheer scale of records, reducing lives and experiences into points of data to manipulate (and in turn reinscribing the same power imbalances the archival profession is slowly working to address in analogue records). I’m excited to see how our profession takes into account these discussions in light of the Code of Ethics and Professional Conduct that was approved in the AGM at the conference. Running alongside the thread on ethics was an emphasis on building relationships with creators and communities. During one of the most engaging panels, Indigenous Voices: Speaking on Truths, Trust and Technology, Angie Bain aptly noted, “technology facilitates access – but to whom?” Often in the pursuit of advancing technology in the archive, two-way relationships between the archives and the user fall to the wayside. Why undertake digitization projects to address “decolonization” if at the end of the project, it doesn’t meet the needs to the community at all? Wal’aks Keane Tait and Melissa Adams argued that archival work must be a living process, and is inadequate without engagement. One of the quotes that stuck with me most was when the process of donation was likened to a “long-term relationship”; it takes work from both sides, placing not only the archives but the user at the center of the archival work right from the beginning, not furthering a lack of human connection. Because at the end of the day, what are we, as a profession, without the people we serve? Archivists must enter into conversation with creators about the unique ways in which their records have been created, generated, and maintained and the ways in which they can(not) be used. I’d like to offer my sincere congratulations to the host committee for a fantastic conference, which not only provided me the opportunity to present my new research, but allowed me to investigate the frontiers of archival theory and practice. My first ACA took me to the Canadian Prairies for the first time, so I made time the day prior to the conference to check out the wonders of Edmonton. Upon arriving downtown, I headed up to Neon Sign Museum, which was impressive even in the daylight. 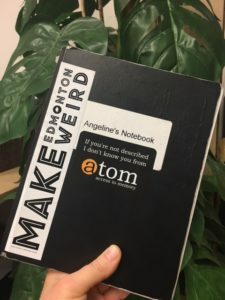 Afterwards , I popped across the street to the Edmonton-centric art and design shop Hideout Distro, where I picked up a Make Edmonton Weird sticker. Then I headed south of the river to historic Strathcona for a walk along vibrant Whyte Avenue. Later, I checked out the Art Gallery of Alberta, which had a few excellent exhibitions on notably Li Salay, a survey of contemporary Métis artists. Suitably acclimatized to my surroundings, I arrived at the conference on Thursday ready for anything that came my way! The panel Going with the Flow: Digital Archiving Workflows was one where I excitedly took copious notes. Case studies and professional narratives that describe the implementation of theories and standards in real life situations are so valuable! In Mediating the Archives: Technology, Truths and Trust, Kirsten Wright presented on find and connect, an online resource which provides descriptive access to records related to care leavers in Australia. This session addressed how access to records containing sensitive information or offensive terminology might be mediated, offering researchers support and content warnings and providing context for archival descriptions. I enjoyed the way the conventional session format was transformed in Indigenous Voices: Speaking on Truths, Trust and Technology through the introduction of a few protocols. In particular, three witnesses were nominated, and at the end each gave their account of what had occurred in the session. The session resonated differently for each witness, illustrating the importance of gathering multiple voices towards creating a deeper and more detailed truth. The content of sessions interwove to strengthen and re-affirm the truth, trust and technology theme. Overall, I was very impressed with the programme and enjoyed the opportunity to connect with colleagues from all across Canada! Every year archivists from around the country descend on a Canadian city to discuss theory, practice, and compare shoes. (Well, some of us compare shoes. I don’t believe it’s a requirement). When Emily asked me to share my experience at this year’s ACA conference, I knew it would be difficult to summarize (particularly in 500 words or less!). But I will do my best! As the Indigenous liaison for the BC Archives, I am always eager to meet representatives from local Nations, and to learn about how Archivists in other provinces are collaborating with Indigenous communities. This year’s conference was held in Edmonton, on Treaty 6 territory. An historic trade route for First Nations and Metis, we specifically recognised the region as the traditional land of the Enoch Nation, and were privileged to have Enoch representatives attend parts of the conference. An Enoch Elder gave a blessing at the start of the conference and stayed on, with his son, to enjoy a meal with us. Coming from the coast, I was fascinated to learn about the protocols around exchanging tobacco in recognition for the Enoch Nation’s generosity in sharing their land with us. The conference was closed with songs from an Enoch singing and drumming group. They arrived at the end of the AGM. Now, I am in no way suggesting that the AGM would put people to sleep (although the general lack of air circulation in the hotel ball room may have contributed), but the room was fairly mellow when the singers arrived. They assembled at the front of the ball room and after a brief introduction, they burst into song. The first note brought tears to my eyes – the singing was powerful and moving. By the end of the second song I felt energized and told the singers so (as I gushed over them, rather embarrassingly). They told me I had taken their medicine; it certainly felt like it! The best part was, it rejuvenated me for the dinner-dance! The conference had a number of Indigenous speakers, both at plenaries and in panel sessions. For me, the theme of “Truths, Trust, and Technology” spoke directly to the work that I do with Indigenous records and communities: questions of whose truth we present, how do we built trust with communities, and is it always appropriate to use technology, were a few of the thoughts I was keeping in mind as I listened to the speakers. Friday’s plenary session “Data Sovereignty for Indigenous Sovereignty” provided an Indigenous perspective on collaboration, authenticity, and appropriation – and so much more. James Delorme, Lee White, and Kristin Kozar spoke about the power of information control and sharing, among other things, and did it eloquently. I was grateful to Kristin for speaking from the heart; the more I work in this field, the more important I feel it is to create a personal connection to the tasks we do! And in writing this post I have taken on James’ reminder that at the conference, as in any event we partake in life, we are witnesses. It is the responsibility of witnesses to share the lessons we have learned with the folks back home. I was unable to attend the panel titled “Indigenous Voices: Speaking on Truths, Trust, and Technology” as it was concurrent to my own panel, but I heard nothing but praise regarding the speakers and the discussion. The panel appointed witnesses, a common coastal practice, to listen and speak back the words at the conclusion of the session. This is something that I would like to see more of in future conferences. This act of witnessing reminds us to be present and to listen deeply. I was lucky to meet with three participants that had traveled all the way from Norway to attend the conference. These Sami (Indigenous Norwegian) archivists were there to learn from Canadian’s experiences with the Truth and Reconciliation Commission, to prepare for their country’s own Commission. Sharing experiences and knowledge with them was interesting – and they proved to be enthusiastic dancers as well! As always, I left feeling inspired, proud, and not a little exhausted. Time to put all these feelings to good use at work! Until next year, my friends. 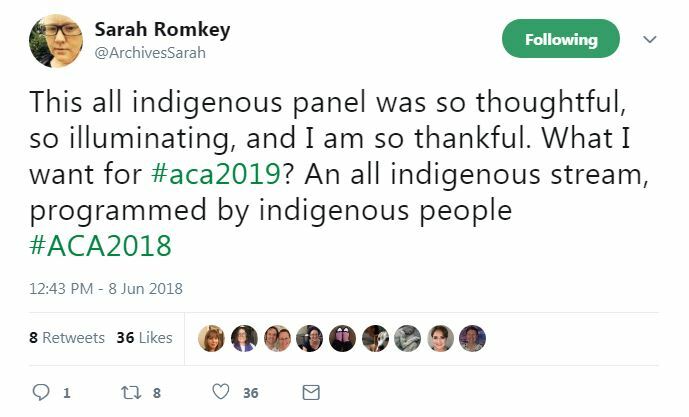 When Emily asked me to write up a summary of my thoughts about ACA 2018 in Edmonton I decided to report particularly on the Indigenous content of the conference. There were a number of talks from Indigenous archivists as well as settler archivists working with Indigenous records and communities. In this age of truth and reconciliation one expects nothing less of a national archival conference; my wish that I keep putting out into the world for ACA 2019 (and beyond) is an entire Indigenous stream selected by Indigenous archivists and community members. Day 2 began with a keynote talk shared by three First Nations people all involved in some way in the Blockchain project at UBC. Some fascinating perspectives were shared and I saw renewed value in exploring blockchain technology because of the Indigenous perspective. Lee White, founder of Reconciliation Dialogue and Chinook Exchange, described the early networks of First Nations communication via grease trails as the original Decentralized Autonomous Organization (if you’re saying to yourself Decentralized wha??? I recommend Peter Van Garderen’s article Decentralized Autonomous Collections for an archival perspective). Later that morning the Indigenous Voices session was a highlight of the whole conference for me. Melissa Adams and Wal-aks Keane Tait set the tone for the session by asking for witnesses to the conversation and offering food (Timbits!) in a Nisga’a practice so that the food would nourish us along with the knowledge we gained. They set a conversational tone that was, to me, new and welcome in the traditional conference setting. Alison Mills challenged the perception that Linked Open Data will achieve the decolonization of archival description- a good reminder for the technologists (such as myself!) to keep our technosolutionism in check. There were other Indigenous related sessions that I didn’t have a chance to attend personally but heard nothing but good things. Notably Erica Hernandez-Read reported on the SCCA’s Response to the Report of the TRC which I’m sure colleagues have been following with interest. Coinciding with the conference was the announcement of the formation of the Access to Memory Foundation! This non-profit org will be separate from Artefactual Systems and will drive the development of the next generation of AtoM software. We at Artefactual couldn’t be more thrilled. Of seven keynote spots only one was filled by a woman. The program committee, while chaired by a woman, was otherwise all male. Not cool, ACA. Before you @ me with the old “But they were the only ones who volunteered!” spiel, this is what you do when you find yourself in this situation- you keep working until you have appropriate diversity. The ACA has a lot of work to do in the arena of diversity (reflected in the strategic plan). 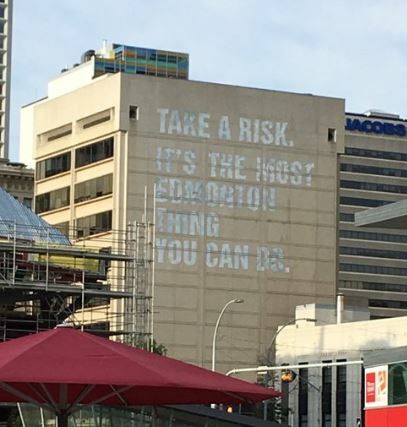 I returned from the Association of Canadian Archives conference on “Truths, Trust, and Technology” in Edmonton simultaneously exhausted and inspired. Now that I’m somewhat recovered, I’m grateful to Emily for the invitation to reflect on the conference. Going through my notes and skimming #aca2018 on Twitter, a theme I noticed over and over again is the complicated relationship between technology and trust. When can archivists trust technology? How can we tell? Is it possible to use technology to increase trust in our holdings or our institutions? In a panel on web archiving, Jana Grazley outlined the ways in which citizens of the City of Vancouver identified the city’s webpages as records and ‘sources of truth.’ Some citizens were alarmed or felt the City was hiding something when web pages were altered or disappeared entirely. Jana explained how the desire to facilitate citizens’ trust of the city’s web archives played a role in selecting a web archiving method that would mimic, as much as possible, the behaviour of a live web page. Jennifer Douglas discussed her research on online grief communities and introduced the concept of “intimate publics” for intensely personal or intimate experiences that may be shared on ostensibly public platforms, such as blogs or other social media. She quoted Boyd and Crawford’s statement that “just because it is accessible does not make it ethical” and called on archivists to be mindful that privacy is always contextual and negotiated. Allison Mills spoke on how technology cannot be treated uncritically as solutions for all problems. She illustrated how, in spite of the fact that linked open data is often hailed as a technology that can support decolonization, the design of linked open data reflects a colonial mindset. The use of technology doesn’t absolve archivists from reflecting on and engaging critically with our practices. As archivists, we cannot always place our trust in technological platforms, but must undertake assessments that go beyond functional requirements. As Kristen Wright said in her panel, “Technology is a tool, not a solution.” We should deploy these tools in ways that we can trust, while also considering the ways in which our decisions can help build trust (or not) with our users and with communities. No ACA recap would be complete without a play by play analysis of the East vs. West baseball game. Too much? Ok, well here is a succinct summary from a long-time player from the east. In the annals of great sports rivalries, the Annual East vs West softball game at the ACA conference surely ranks up there with Maple Leafs/Canadiens, Yankees/Red Sox, Celtic/Rangers, etc., at least in our own minds. However, for all the big talk that can go on before, during, and after the game, it is a friendly rivalry in which both sides can cheer each other’s great plays, chuckle at our own mishaps, and celebrate a game well played at the conference pub after the final out has been made. The ballgame dates back to the fourth ACA conference held in 1978 and, while I don’t think any of us on the field this year realized it, on this, the 40th matchup, the two sides were tied with 14 recorded victories apiece (several years had no results recorded and a few were rained out). It was a historic match in the making and the teams battled it out to the final inning for the Doughty Cup. The East took an early lead but the West made significant gains and took control mid-game, leading by several runs by the final inning. In their final at-bat, the East pulled ahead and, in the end, were able to hold off the West during the bottom of the 7th and eke out a two-run victory. At the ACA ballgame, all are welcome to play and everyone assembled on the diamond comes out for a good time. This year’s match was broadcast on Facebook Live and, as can plainly be seen, we are not superstars. A lot of us play only once a year at the conference and some who stepped up to the plate had never played baseball before. Regardless of skill level, all are cheered on and virtually everyone who played had their star turn. The opposing teams share gloves, high-fives, and sometimes players (sorry, Manitoba). 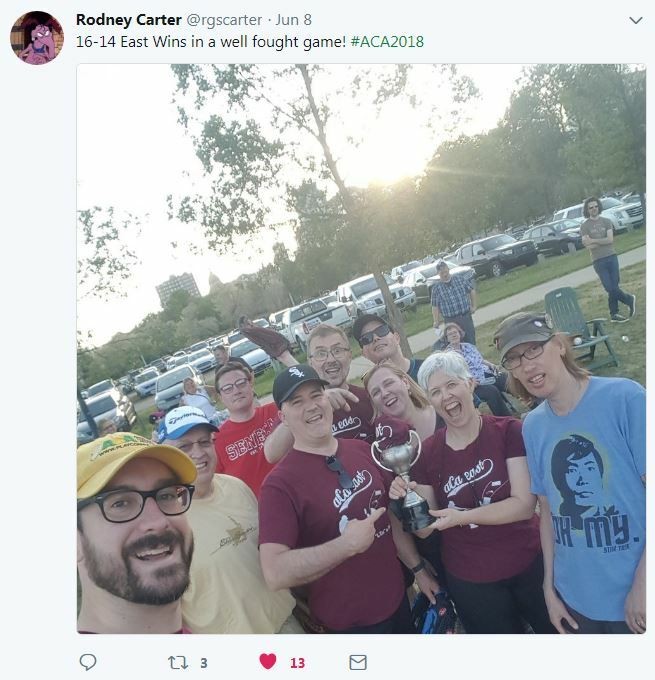 Personally, the game is one of the highlights of the conference for me and I encourage everyone who attends the ACA to bring a pair of running shoes and give the game a shot, at the very least, coming out to cheer on your colleagues in this most venerable ACA tradition. Sounds like this year was another wonderful conference. Thank you to all my guest posters for providing their thoughts and memorable moments from ACA 2018. Roll on Toronto, 2019!